Do YOU suffer from Stage Fright? Have a look at this check list, do some of these things happen if you speak in front of groups or at work or avoiding speaking in front of groups all together? 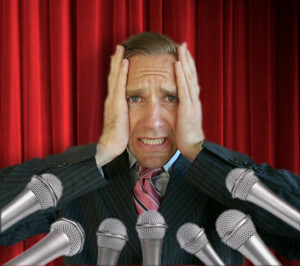 If you experience some of these symptoms, then you probably are experiencing Stage Fright. If you do suffer from Stage Fright – then you will need to learn how to manage and overcome your Stage Fright symptoms. Remember, your audience may not even notice that you may be nervous. Your audience are there to hear what you have to say, they want you to succeed. Its not about you, its about informing your audience. What is Stage Fright? This is the body’s response to a fearful situation – if you are viewing the situation of speaking in front of people as fearful, then the body goes in to the Fight or Flight response – the body closes down the digestive system and adrenalin is secreted and the heatbeat starts to raise and the other symptoms appear. It really affects the breathing. When the voice goes up, it is the vocal cords not being used , they are less extended. Pressure is put on the vocal cords so they dont vibrate. Inside our heads, we think the audience sees nervousness. In reality, the audience don’t see it. Watch your posture, try to have relaxed shoulders and torso. The more relaxed , the more breath can go in. In preparation of your presentations, watch out for long sentences because when speaking in long sentences you will be much,more likely to experience loss of breath and struggle with the grammar. Remember shorter sentences give much more opportunities to take breaths. It used to be sentences were around 30 words per sentence but now sentences of 12 – 14 words is all the audience can handle (this is the effect of modern media). Remember – In the PAUSE, comes the APPLAUSE! In the Pause, you can breathe and this really helps! If you view the activity as fearful then there is a high probability of the sympotms starting. Remember, you are not alone but its in your best interests to learn methods to handle your Stage Fright or anxiety. You need to be proactive here – work out what works for you to relax yourself. Step 1 – Acknowledge that you are experiencing Stage Fright symptoms and accept thats whats happening. Accept, Acknowledge and get on with the job of handling the symptoms instead of fighting the symptoms. Step 2 – Preparation is vital. Preparation is important for reducing the symptoms of Stage Fright. If you are prepared and have everything ready, you know what you want to say , even if you need to use notes, this reduces the anxiety associated with Stage Fright. Have your speech prepared in note form, arrive early and know your speaking area, wear comfortable, suitable clothes and especially shoes. * Do a meditation or some form of relaxation before hand. Just sitting taking a series of long deep breaths, thinking about the process of breathing will be most beneficial. * As you are waiting for your turn, sit and open and close your hands as slowly as you can. There are some sedative effects in the hands and this will help you to relax. * Again, remember to breathe! Working on every way to get oxygen to the brain helps!! Prevention – If you stop doing the wrong thing, the right thing will do itself. The problem is we dont trust ourselves with getting on with the job. The final message – It is possible for every Human Being to overcome Stage Fright – it is all about how you learn to handle the symptoms. I would like acknowledge and thank Lesley Stephenson from Speaking Solutions http://speakingsolutions.ch/about_lesley.php. I attended a seminar Lesley ran at Toastmasters International and realised how the symptoms of Stage Fright hold people back from their full potential. These are my notes from her wonderful presentation. If you experience the symptoms of Stage Fright, follow the recommendations here and learn what works for you so you succeed. Here’s The Speakers Practice 5 Tips to Reduce the Fear of Speaking in Public – http://youtu.be/nPbpHqQSTVU Best of wishes.